​I think it’s human nature for God’s followers to feel at times like we’ve been dropped off in the middle of nowhere and left to fend for ourselves. Most of us who grew up in small towns are aware of the occasional “pet dropoff,” when someone had a cat or dog they either didn’t want to mess with or couldn’t get rid of. Dumping them on an old country road, far from home, the animals were left choking on a cloud of dust and gravel as the car sped away. And that, as they say, was that. Such images are engraved in my head, partly because there have been times over the years I’ve felt God had abandoned me in a similar fashion. Is my faith lacking? Since God said he’d never leave or forsake His children (Deuteronomy 31:6, 8), are my feelings of spiritual abandonment uncommon? Just do a Google search for “Bible verses about feeling abandoned.” You may be surprised at how many of our biblical “heroes” felt like God dropped them off on an old country road and sped away, laughing hysterically at their misfortune. But He is a loving Father, and has our best interests at heart. Everything we suffer is meant to strengthen our faith and/or bring others to a saving knowledge of Jesus Christ. One thing I’ve learned is to try and keep my eyes fully on Christ, trusting Him implicitly. True faith means knowing He carries us through the dark times, never doubting the twists and turns of the narrow road. I’m not at the place of “full trust” yet, but I’m working on it. 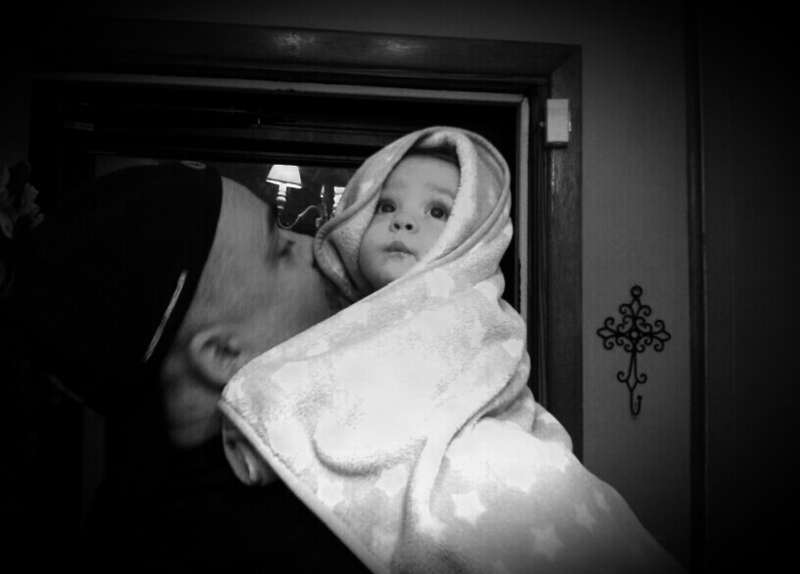 The picture above, of me and my grandson when he was only a few months old, reminds me of the faith we must put in our God. My daughter wrapped baby Joshua in a warm blanket, to shield him from the cold, winter night, and then we passed him around, from one to the other, so everyone could give him “goodbye kisses.” But he was paying no attention to us; he was fascinated by our entryway light, never taking his eye off of it the whole time. To me, he looks like an angel, wrapped in purity, gazing longingly at Heaven. Not once did he worry about being dropped. Not once did he wonder if we were going to hurt him. Not once did he stress about the cold, night air. He just rested in our arms and kept his eyes on the light. Tough job, that, but as God-chasers, it should be our goal. As a child is gently rocked to sleep in the arms of their guardian, so must we find solace in our God. Trust the Lord to have your best interests at heart. Let Him take the wheel.